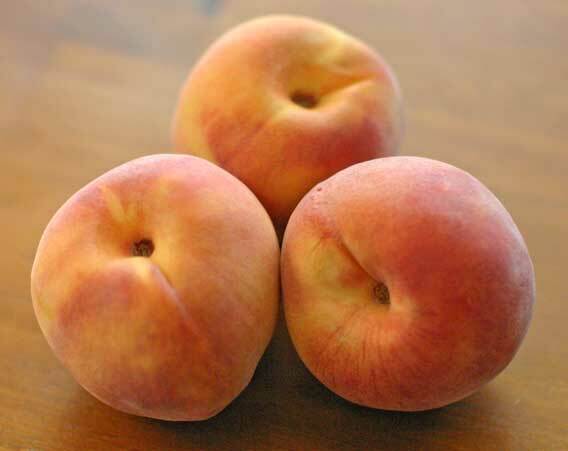 Sweet, juicy yellow peaches are such a nice segue into fall fruits. Our local farmers markets are still brimming with them, and this recipe is a yummy way to use some. It’s the perfect treat to cool you off on an Indian summer day. Peach Crumble Ice Cream is a refreshing take on an old favorite. Admit it, you were going to put ice cream on your crumble anyway, so why not have it all in one? 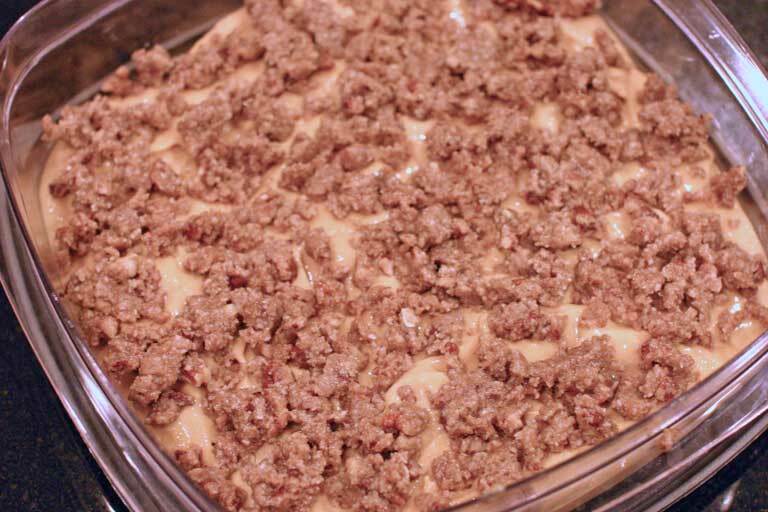 Here, the cinnamon pecan crumble topping is mixed into the ice cream, for extra mouthwatering bursts of sweetness. You’ll need to freeze the ice cream maker’s canister overnight before you make your ice cream. I like to turn my freezer temperature down to -1° or -2° C, just while the canister is in there, to make sure it freezes thoroughly and doesn’t thaw too quickly while the ice cream is processing on the counter. If your canister isn’t cold enough, the ice cream won’t congeal as its churning. Cut your peaches open, remove the pits and peel all but two of them. Blend the two peaches with their skins still on, in a high-speed blender, until they become a thick juice. (Note: If you don’t have a high-speed blender, like a VitaMix, that can liquefy the skins, then you may choose to peel the last two peaches as well.) 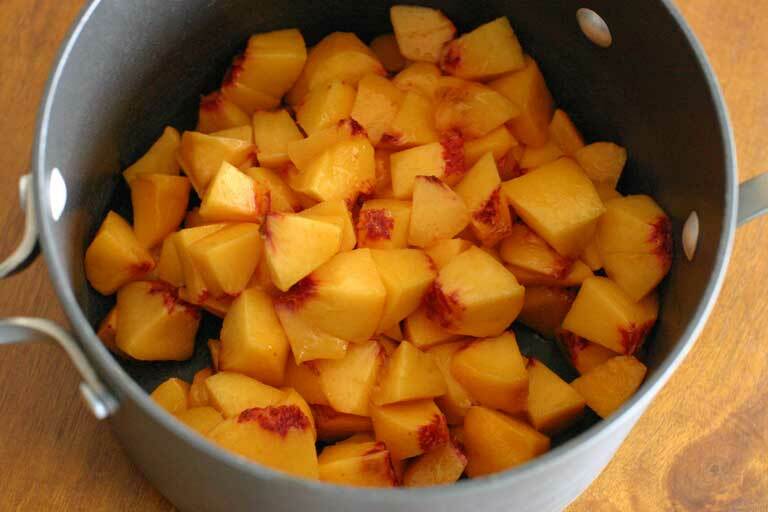 Chop the remaining six peeled peaches and toss them into a saucepan. Pour the peach juice over the chopped peaches. Add the lemon juice and maple sugar. Simmer to reduce the peaches, stirring occasionally, for about an hour. 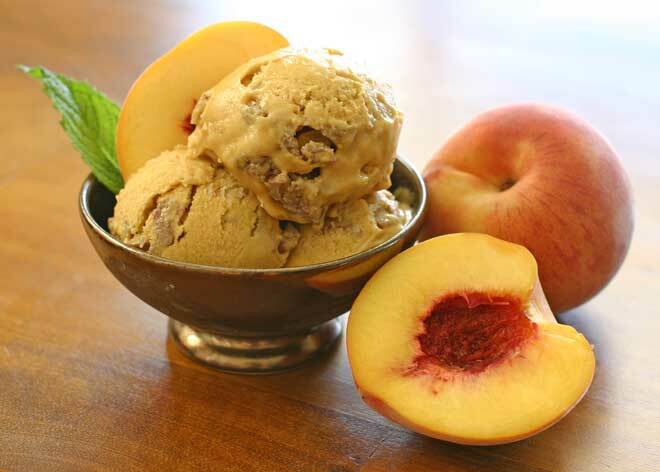 This reduction step really concentrates the flavor of the peaches in the ice cream. In the meantime, open two young Thai coconuts, pour out the water (but don’t discard it, it’s delicious to drink by itself and a nice hydrating boost when added to smoothies), and scoop out the flesh. Remove any of the brown husk that sticks to the white coconut flesh, and place all of it in a one-cup measuring cup. If you’re lucky, the flesh from two coconuts will total about a cup. If you come up short (and you may, every coconut yields a different amount), pour some coconut milk over top until the measuring cup is full. 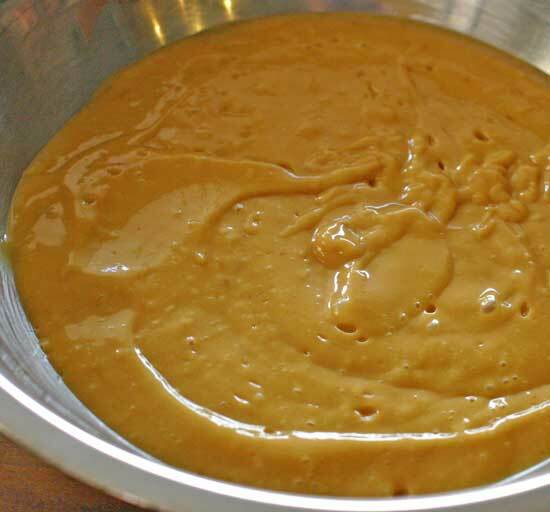 At the end of the hour, pour the reduced peaches into the blender, add the cup of coconut flesh and extra milk (if any), pour in the maple syrup, an additional 1/4 cup of coconut milk, and a tablespoon of vanilla extract, and whiz it all up into a thick purée. Store in the fridge until you’re ready to make the ice cream. Now is a good time to prepare the topping. 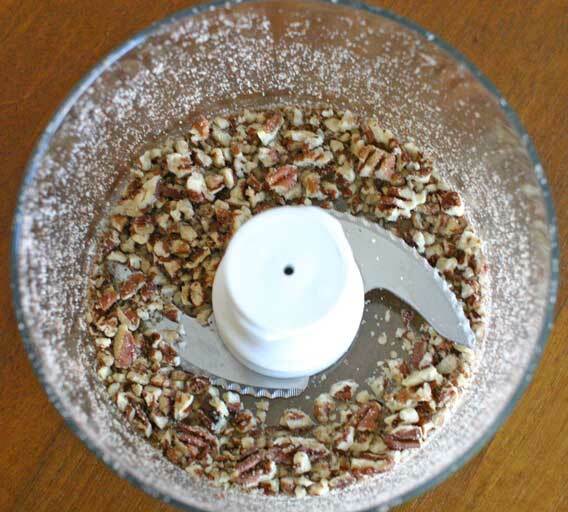 Chop the pecans into small pieces in a food processor. Put the almond flour in a small bowl and use a pastry blender tool or a fork to cut the coconut oil into the flour. Add the cinnamon, maple syrup, whole cane sugar and vanilla extract, and continue blending the mixture into a “crumble” consistency. Finally, stir in the pecans. Set aside. When your peach mixture is completely cold, it’s time to make the ice cream. Pour the mixture into the ice cream maker and process it for about 20 minutes, until it has firmed up and looks like soft ice cream. In the final step, spoon out about half the ice cream into a freezer-proof container, to make your first layer. Then use your fingers to spread the crumble topping over top. This will be your middle layer. Scoop the remaining ice cream out over top, creating the final layer, and then store in the freezer until you’re ready to serve it. This layering technique gives you a substantial swirl of cinnamon pecan crumble in each scoop of ice cream. If you can, wait until it’s nice and melty before eating, for the sweetest, creamiest flavor. Enjoy!